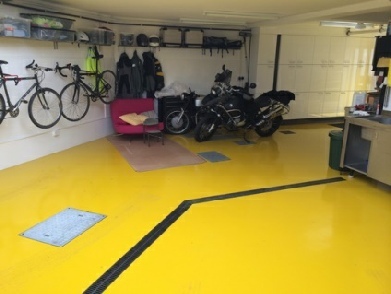 Industrial grade Epoxy Resin and Polyurethane flooring systems are particularly suitable for Domestic Garages and Workshops and other applications where a hard-wearing, attractive floor finish is required. Providing a low maintenance and durable floor that helps reduce dust problems, they are available in a range of decorative colours and textures that also provide a comfortable work surface. Surface applied damp proof membranes are also available if required. Depending on the particular environment, both the epoxy resin and polyurethane systems are available with properties such as anti-slip and enhanced chemical resistance where necessary in the event of likely spillages and possible contamination from aggressive liquids and other hydraulic fluids and fuels. Please visit our website www.domesticgarageflooring.co.uk for more detailed information.